As a local small business owner, Jase Bolger understands the solutions we need to create jobs and make Michigan competitive. Representative Bolger has made working for jobs his top priority. 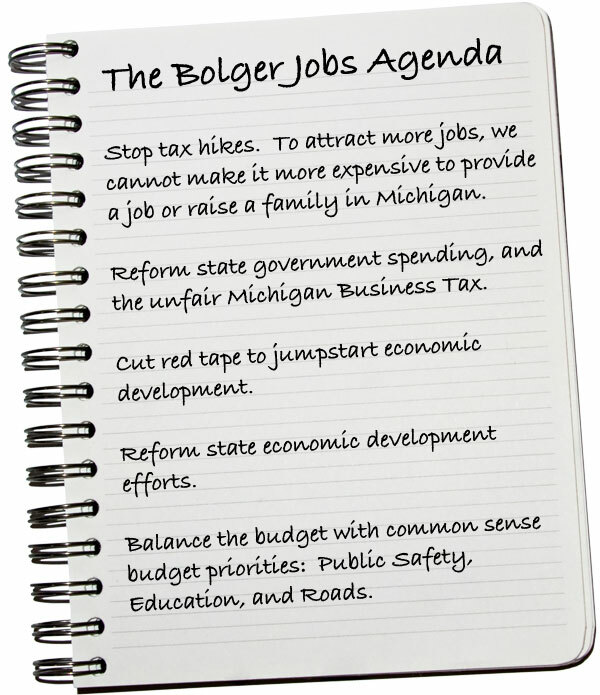 Representative Bolger's strong leadership in passing a responsible budget, and doing away with the disasterous Michigan Business Tax in favor of a fair and competitive corporate tax, has led Michigan from a worst in the nation jobless rate of over 13% to our current unemployment rate of 9.3%. A recent update to the annual Tax Climate Index by the Tax Foundation showed Michigan's corporate tax ranking has skyrocketed from 49th all the way up to 7th! Our overall business tax climate is now 12th best in the nation, compared to 18th previously.